Having dragged Emma all the way to Montreal to watch the Formula 1 race the weekend before, it was something of a surprise that she agreed to come with me the following weekend to the Indycar race in Toronto. 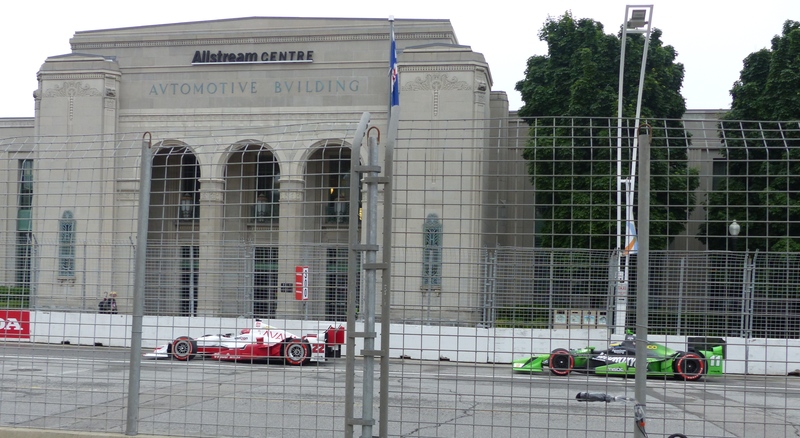 Indycars are the American version of Formula 1, and they have been visiting Toronto for 29 years. This year, the race was brought forwards to June, so not to clash with the Pan Am Games which Toronto is also hosting. 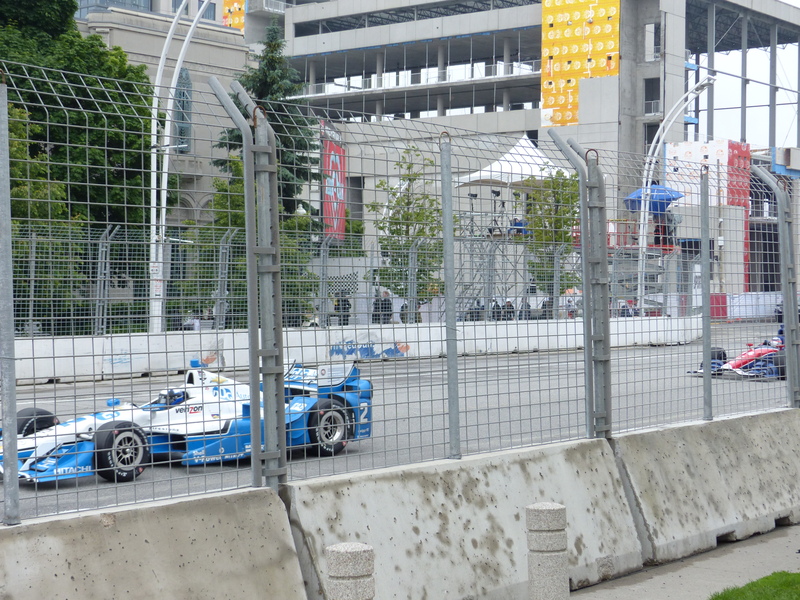 The Toronto race is a street circuit, and the cars speed around the tight and narrow confines of the temporary track at Exhibition Place. 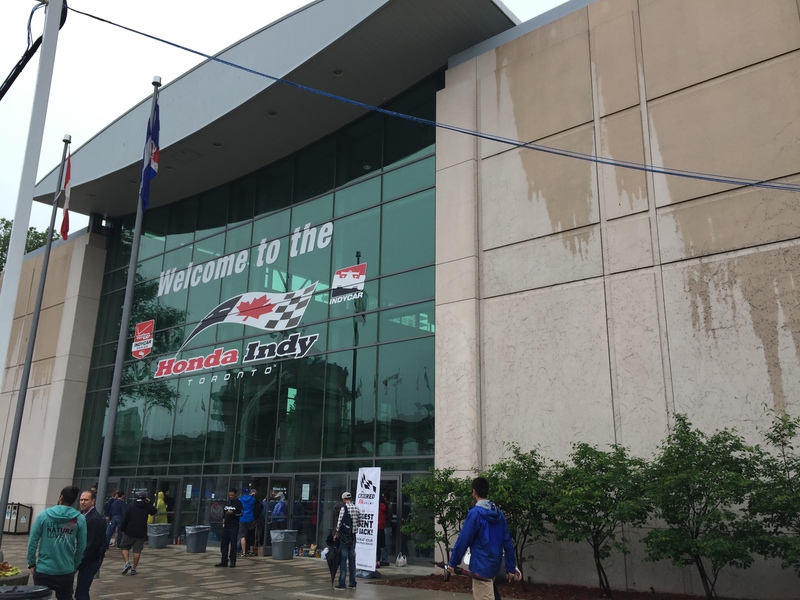 A damp and grey entrance to the Indycar race! Having paid for a grandstand seat at the F1, this time round we went for the cheaper general admission option. 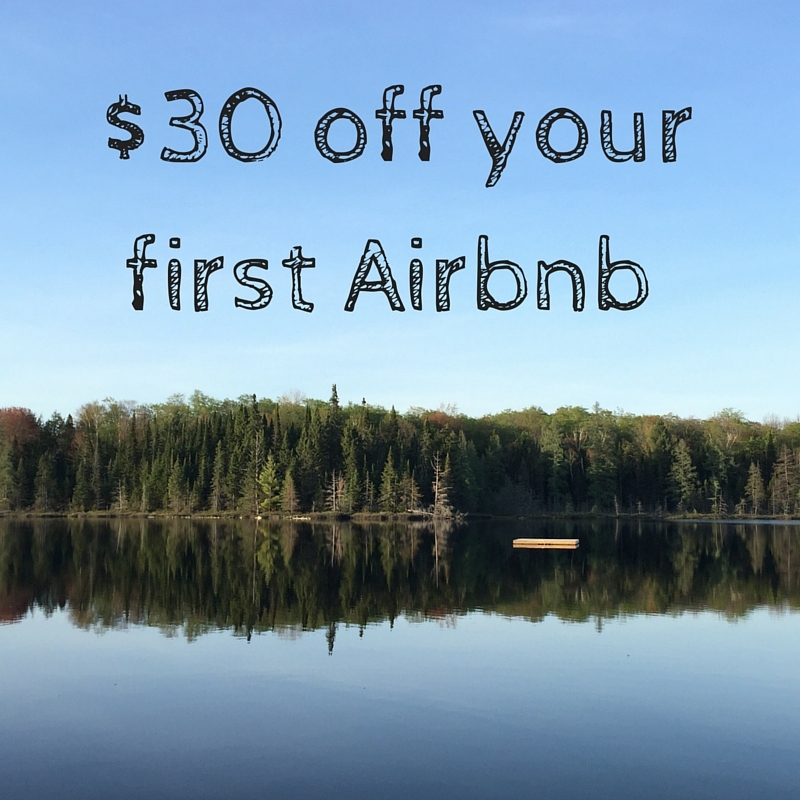 At $35 each, it represents a cheap and fun day out. Luckily enough we found a spot near the first corner to watch the race, and perched on top of a concrete block so to get a better view of the action. 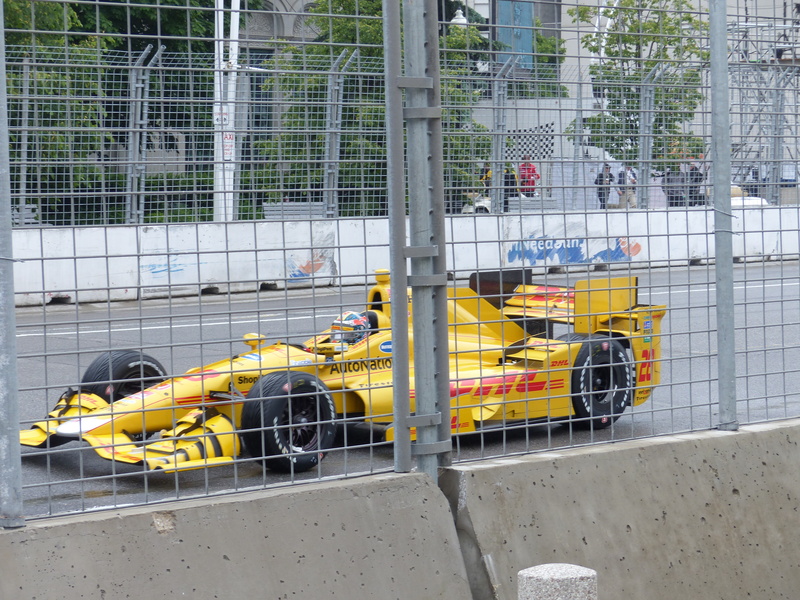 The race started on a damp track, so drivers, like Ryan Hunter-Reay here, started on wet weather tyres. The race started in damp conditions, but things soon dried up. The changing conditions, and therefore differing strategies, resulted in none of the fastest drivers in qualifying, Will Power (yes, that’s his real name), Simon Pagenaud or Juan Pablo Montoya, winning the race, as American Josef Newgarden raced through from a starting position of 11th to win. 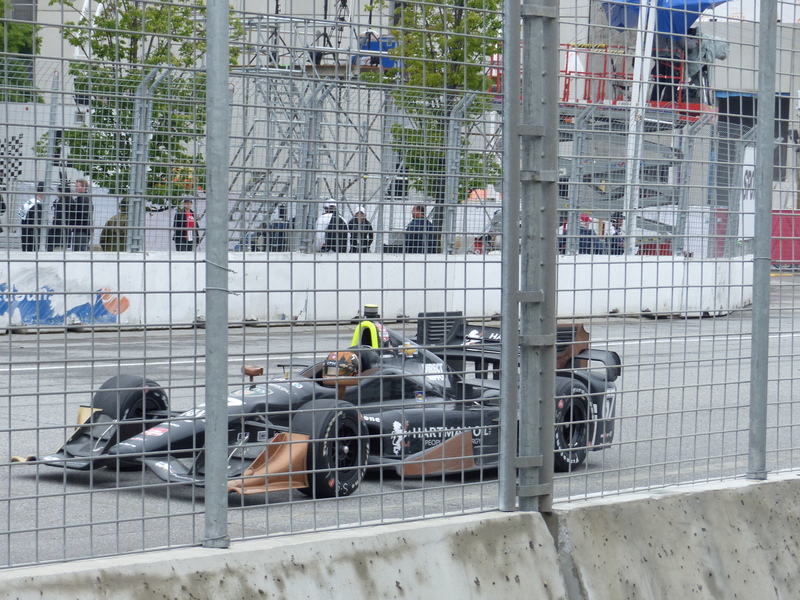 Defending champion, Will Power, couldn’t convert pole position into the race win. 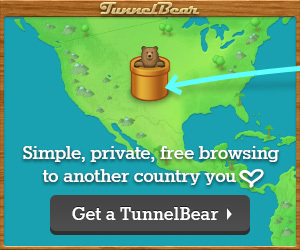 So what has any of this got to do with this post’s title? Well midway through the race Emma was approached by CP24 and asked if we would like to be interviewed. Surprisingly, given that she doesn’t like talking to people at the best of times, Emma said yes, and we soon had a reporter getting a lowdown on who we were, where we were from and who we were supporting ahead of our big moment. Now I’ve scoured the internet, and fortunately for us not getting embarrassed, but unfortunately for the illustration of this point, I can’t find the clip of our interview. Don’t slouch down to the level of the microphone so you look like a hunchback. The reporter is the professional, they’ll know the right place to hold the microphone. Just look at the reporter – don’t flick your eyes over towards the camera. That will just look weird and shifty! Forget the camera is there! Try not to be put off by the reporter’s smiles and head nods – they are just trying to look interested in your answer. Try not to let you mind wander off on a tangent about the reporter’s incredibly heavy makeup whilst trying to answer a question at the same time as a pack of noisy race cars fly past. No doubt the makeup is there for TV purposes. Try not to waffle on – try and think about what you might say beforehand! Could you even ask the reporter what kind of questions they’ll be asking? Whilst we couldn’t find a clip of our TV interview, we did put together a short video, which shows the speed of the cars as they flew past on their way down to the first corner. You can watch it below, or here. Formula 1 old boys Juan Pablo Montoya and Takuma Sato battle it out. Anyway, so how did the show compare to the Formula 1? Well for starters, Indycar clearly isn’t as big as deal in any sense. If this had been a F1 race, no way would we have been able to have turned up when we did and get the standing spot that we had. So not only is the crowd size smaller, but just from the associated commercialism, paraphernalia and general atmosphere it feels less important. Formula 1 may have its critics, and always seems to be lurching from one crisis to another, but it clearly has done some things very well. A few pictures of some of the other cars during the race. Saying all that, we still enjoyed the Indycar race, and the entrance fees are significantly cheaper (F1 has to pay for all that razzmatazz somehow). 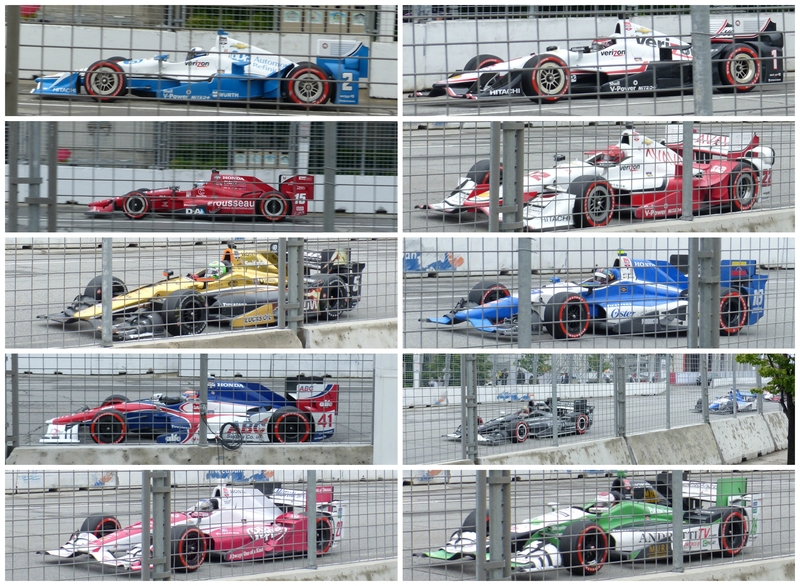 The Indycars were certainly noisy and quick – it was impressive watching them race on a damp and bumpy street circuit, with a mixed surface of tarmac and concrete. I don’t think we’ll forget either how by being so close to the track we got a covered in a fine mist of tyre dust! 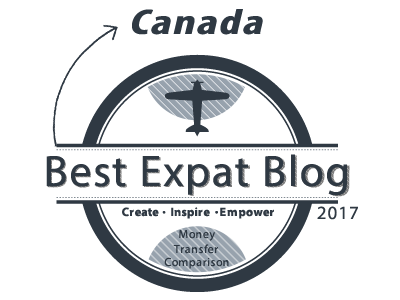 Previous Previous post: What makes expats grumpy?